Huawei’s sub-brand Honor has finally launched the much anticipated Honor 7X in India at a starting price of Rs 12,999. The Honor 6X’s successor comes with an all-metal design, a dual camera setup at the rear and fairly powerful specifications for the price. Most importantly, the Honor 7X embraces the bezel-less mania that has permeated smartphones as of late with its expansive 18:9 display. The Honor 7X is set to go on sale from 7 December onward exclusively via Amazon India. 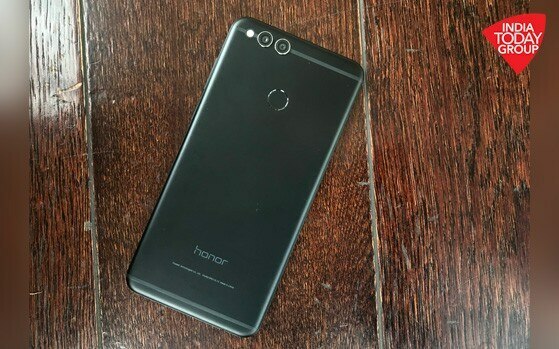 Huawei is banking on the Honor 7X’s dual cameras and bezel-less design to set it apart from fierce competitors like the Xiaomi Mi A1 and Moto G5S Plus. Just like the Honor 9i, the Honor 8 Pro features a bezel-less design with a matte back and a chassis made out of metal. The smartphone not only looks classy and premium but is also built quite well. There are no physical buttons on the front fascia – the 7X makes do with virtual keys for back, multi-tasking and home. There is a fingerprint sensor at the back which can be used for a variety of functions such as sliding down the notification panel. The biggest USP of the Honor 7X is the expansive 5.9-inch display up front which has a resolution of 2160×1080 (FullHD+) and an aspect ratio of 18:9. Huawei claims that the minimal bezels up front allow them to fit a 5.9-inch display into what is basically a 5.5-inch form factor. The display is bright and punchy and is covered by 2.5D glass which not only looks premium but enhances in-hand feel. The 18:9 aspect ratio lends itself well to gaming and multimedia consumption. While the top and bottom bezels on the 7X are not as small as those seen on smartphones like the LG G6 or the Galaxy S8, it is excusable given the 7X’s affordable price. The Honor 7X has fairly powerful specifications for the price. The smartphone is powered by Huawei’s own HiSilicon Kirin 659 chipset paired with 4GB of RAM and a 3,340mAh battery which the company claims is good for 12 hours of video playback and 91 hours of music playback. There is 32GB or 64GB of storage on board depending on the variant which can be expanded via a microSD card (of up to 256GB). In terms of software, the Honor 7X runs on Android 7.0 Nougat out of the box with Huawei’s custom EMUI 5.1 skin on top. It is not known at the moment when the smartphone will be updated to EMUI 8 which is based on Android 8.0 Oreo. Huawei claims that EMUI 5.1 intelligently optimises user experience by learning and predicting user behaviour. It also has various features built-in such as the ability to run two iterations of the same app, knuckle based gestures, scrolling screenshot and so on. The Honor 7X supports 4G VoLTE, dual-band Wi-Fi 802.11 a/b/g/n/ac, GPS/A-GPS and GLONASS. The presence of a microUSB port for charging and data transfer instead of USB-C is a shame. Audiophiles will rejoice at the fact that the 7X comes with a 3.5mm headphone jack which is fast becoming a rarity in today’s smartphones. The Honor 7X comes with a hybrid SIM slot – which is a little disappointing. This basically means that you cannot expand the internal storage whilst using two SIM cards. Just like the Honor 6X, the Honor 7X comes with a dual camera setup at the rear that allows for the capture of bokek shots (images with depth of field effects). There is a primary 16MP sensor which is paired with a 2MP secondary sensor, the sole purpose of which is to capture depth data. On the front, the Honor 7X comes with an 8MP sensor for selfies. Despite having just a single sensor up front, the 7X allows for front facing bokeh shots which are produced via software algorithms. The camera app is loaded with features such as filters, time-lapse, light painting, slow motion video capture and panorama. There is also a fully featured Pro mode that allows enthusiasts to play with the ISO, exposure, shutter speed and so on. The Honor 7X has been launched in India at a starting price of Rs 12,999. The smartphone will go on sale from December 7, 12 noon onward exclusively via e-commerce giant Amazon India. It is available in the following colour options — Blue, Gold, and Black. There are two variants of the Honor 7X on offer – one with 4GB of RAM and 32GB of internal storage for Rs 12,999 and one with 4GB of RAM and 64GB of internal storage for Rs 15,999.